I try to stay out of politics on this website. This post is not mainly about politics. It’s a call to action. We’re trying to do something rather simple and clearly worthwhile. We’re trying to create backups of US government climate data. • Oliver Milman, Trump’s transition: sceptics guide every agency dealing with climate change, The Guardian, 12 December 2016. • Brady Dennis, Scientists are frantically copying U.S. climate data, fearing it might vanish under Trump, Washington Post, 13 December 2016. Of course saving the data publicly available on US government sites is not nearly as good as keeping climate programs fully funded! New data is coming in all the time from satellites and other sources. We need it—and we need the experts who understand it. Also, it’s possible that the Trump administration won’t go so far as trying to delete big climate science databases. Still, I think it can’t be a bad thing to have backups. Or as my mother always said: better safe than sorry! The efforts include a “guerrilla archiving” event in Toronto, where experts will copy irreplaceable public data, meetings at the University of Pennsylvania focused on how to download as much federal data as possible in the coming weeks, and a collaboration of scientists and database experts who are compiling an online site to harbor scientific information. In Philadelphia, researchers at the University of Pennsylvania, along with members of groups such as Open Data Philly and the software company Azavea, have been meeting to figure out ways to harvest and store important data sets. The event is part of a broader effort to help San Francisco-based Internet Archive with its End of Term 2016 project, an effort by university, government and nonprofit officials to find and archive valuable pages on federal websites. The project has existed through several presidential transitions. I hope that small “guerilla archiving” efforts will be dwarfed by more systematic work, because it’s crucial that databases be copied along with all relevant metadata—and some sort of cryptographic certificate of authenticity, if possible. However, getting lots of people involved is bound to be a good thing, politically speaking. • PPEHLab (Penn Program in the Environmental Humanities), DataRefuge. At the help form on this website you can nominate a dataset for rescue, claim a dataset to rescue, let them know about a data rescue event, or help in some other way (which you must specify). • PPEHLab, DataRefuge meeting, 14 December 2016. • Rally to stand up for science, 13 December 2016. And the “guerilla archiving” hackathon in Toronto is this Saturday—see below. If you know people with good computer skills in Toronto, get them to check it out! RSVP and up-to-date information: Guerilla archiving: saving environmental data from Trump. This event collaborates with the Internet Archive’s End of Term 2016 project, which seeks to archive the federal online pages and data that are in danger of disappearing during the Trump administration. Our event is focused on preserving information and data from the Environmental Protection Agency, which has programs and data at high risk of being removed from online public access or even deleted. This includes climate change, water, air, toxics programs. This project is urgent because the Trump transition team has identified the EPA and other environmental programs as priorities for the chopping block. The Internet Archive is a San Francisco-based nonprofit digital library which aims at preserving and making universally accessible knowledge. Its End of Term web archive captures and saves U.S. Government websites that are at risk of changing or disappearing altogether during government transitions. The Internet Archive has asked volunteers to help select and organize information that will be preserved before the Trump transition. Hacking scripts to make accessible to the webcrawler hard to reach databases. Skills needed: We need all kinds of people — and that means you! This entry was posted on Tuesday, December 13th, 2016 at 10:09 pm and is filed under risks, the practice of science. You can follow any responses to this entry through the RSS 2.0 feed. You can leave a response, or trackback from your own site. How do you obtain next December’s Guardian and WaPo articles? I’m sure (I hope) that by “hackers” they mean “good creative programmers” rather than “people skilled at illegal means of access”. Given various recent events, it would be good if they’d clarify that. This inspired me to donate to Internet Archive. There are already guerilla archives of the various published series — they get used frequently on anti-alarmist sites like Watts Up With That to show how each new series with further corrections and adjustments has somehow managed to cool the past and warm the present yet further. There’s a lot more data than the famous time series of global temperatures or even the larger amounts of temperature data those are based on. There’s carbon dioxide concentration data, sea ice data, sea level data, ocean pH and salinity data, air pollution data, hurricane data, etc. etc. etc. Like Sage said, archiving is very bad when you want to change the past..
NOAA global report for 1997 stated that global avg for 1997 was 16.92C (62.45F) without much alarming language. 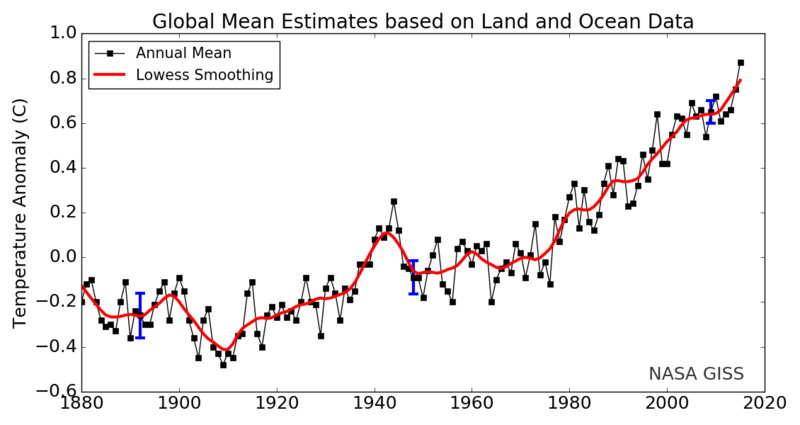 NOAA report for 2015 stated that global avg was 14.8 C which a lot of alarm in the report, 2C global cooling.. Inconvenient truth, let’s hope this can be erased somehow.. 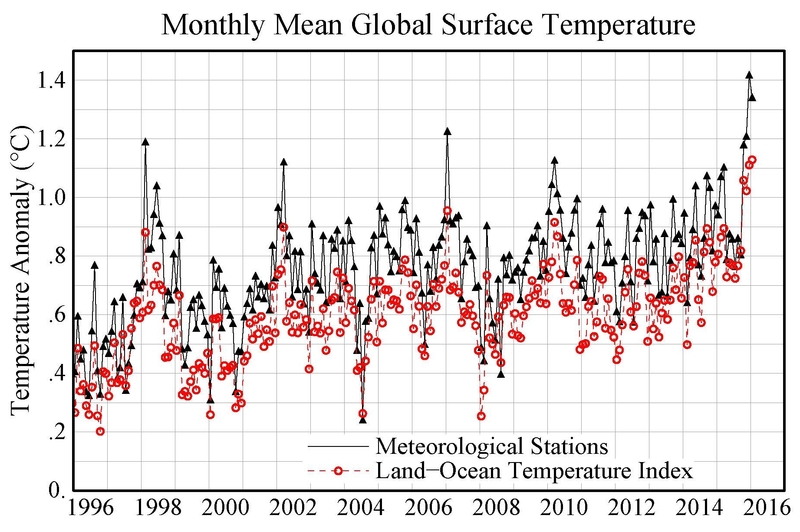 This graph ends on February 2016, another huge El Niño spike. But the overall trend is up. I’ll delete further global warming denial on this thread. I want to discuss ways of saving climate data. Google have project to show to the public some access to image data, for example Google project art and Google books. I think that these are project to allow the public to obtain free access to lots of data. Having the software, the servers and storage space, it could be useful to use its resources to get the free distribution of scientific data (not only climate, not to alienate a political party) to create a reliable tool used by all the world’s scientists: the gains are obtained from the number of the users, and would be a method to bring on its platforms other users, and some billionaire could finance the project. I worried that it would be easy to attack not independent sources of data manipulation. I want to get you involved in the Azimuth Environmental Data Backup Project. But first here’s a post with some background. Starting a few days ago, many scientists, librarians, archivists, computer geeks and environmental activists have started to make backups of US government environmental data. We’re trying to beat the January 20th deadline just in case these backups are required. Backing up data is always a good thing, so there’s no point in arguing about politics or the likelihood that these backups are needed. The present situation is just a nice reason to hurry up and do some things we should have been doing anyway. • Saving climate data (Part 1), Azimuth, 13 December 2016. A lot has happened since then, but much more needs to be done. It’s about time. I suggested using multiple mirrors to prevent censorship years ago. I think we’re doing well. The Climate Mirror effort shows how well we are doing overall, and their reports do not reflect the substantial captures this project, here, has been able to achieve, despite technical obstacles.